Whether they are nesting in a hole in the wall or ground, or there is a hanging nest in a tree, there are actually several species of wasps and bees that we regularly deal with in BC. Yellowjackets actually refers to a group of wasps in the Vespula or Dolichovespula genera. But when most people refer to a yellowjacket, they are thinking of the Western or German yellowjacket which are small, about 10 mm in length, bright yellow and black. The yellowjacket tends to be the most aggressive type of wasp or hornet we see here in Vancouver. Their nests contain hundreds to thousands of individuals and they are quite protective of their nests. Yellowjackets build nests underground, in wall voids, attics or crawlspaces using small holes or cracks to access the void space. As summer progresses, yellowjackets increasingly feed as scavengers which increases the sting risk as it brings the yellowjackets in close contact with people. Meat and carbohydrates at picnics, barbeques, and garbage can attract large numbers of yellowjackets. Overripe fruit that falls from trees will also attract large numbers of them. 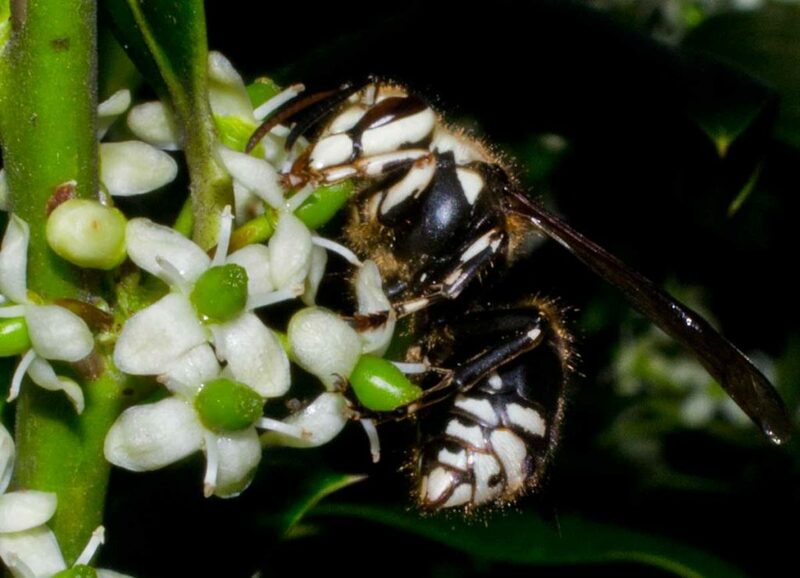 Bald-faced hornets (Dolichovespula maculata) are relatively large, mostly black with white to yellowish markings on the front of their heads. This type of hornet generally builds a paper covered nest in trees and bushes but nests can also be attached to buildings. It is not unusual for a nest to be the size of a basketball by the end of the summer. While this is the largest of the wasps or hornets we encounter here in Vancouver, they pose a lower sting risk than the yellowjackets as bald-faced hornets feed on other insects, typically showing less interest in the food we eat, so they tend to be less of a nuisance at outdoor events. Mud daubers (Sceliphron caementarium) are generally considered non-aggessive and will not generally sting unless they are directly handled or threatened. This wasp is easy to identify both by it’s appearance and it’s nesting behavior – they have very long legs and a long thin “waist”, they are solitary and build small mud nests stuck to rafters, under decks or on the undersides of soffits and eaves of a building. Paper wasps (Polistes spp.) is a group of wasps which are large, up to 25mm in length, with a distinct thin waist and long legs. Most are brown or darker, with large patches of yellow or red. Their paper nests hang like an open umbrella from a pedicel or stalk with the cells visible from below and no paper covering. They are usually in protected areas, such as under eaves, in attics, or under tree branches or vines. While each nest may have more than a hundred individuals, they tend to be non-aggressive. Bees are important pollinators and should only be eliminated if necessary. The stinger of a bee is barbed, so when forced to defend themselves, the stinger becomes stuck and the bee is unable to pull it out. The bee will tear itself as it tries to get free, eventually dieing from the injury and leaving the sting behind with the venom sack still pumping. For honeybees, we strongly recommend they be collected by a beekeeper. We would be happy to refer one if the problem is confirmed to be honey bees. 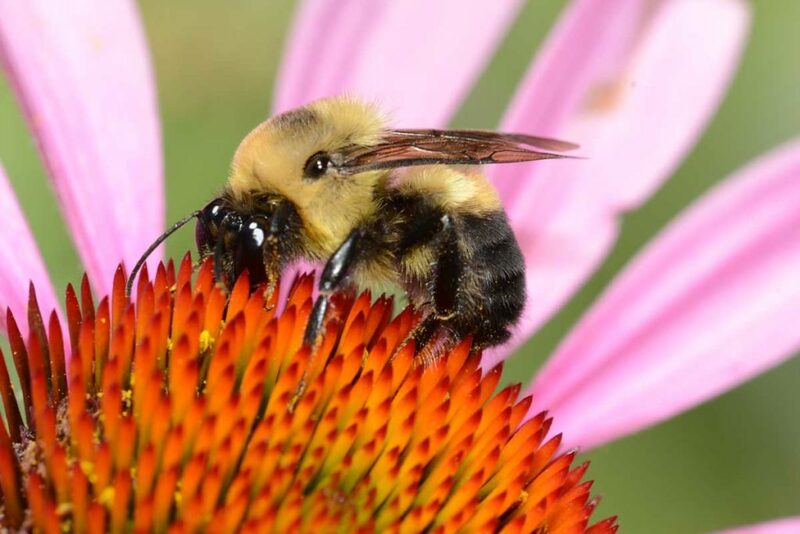 The slow, larger, fuzzier bumble bees will nest in the ground, in piles of vegetation and in unused compost bins, in insulation and in old mouse burrows. Bumble bees tend to be active in early spring and are often not seen in the hot summer months. Bumblebees are typically not aggressive but they can be a problem if their nest is in an area you frequent. For more information on our pest control services, visit our FAQ page. If you cannot find the answer you are looking for, fill in an online form or call us at 604-463-0007.